People with time-space synesthete literally experience a time-space connection. They feel like the phenomenon of time must have a physical reality. To them, time is like the applications and icons in an iPad screen laid out for them. They can physically point at specific dates in space like you could flip or touch-select an icon in a touchpad. They see time in definitive sizes, dimensions, locations and even color. 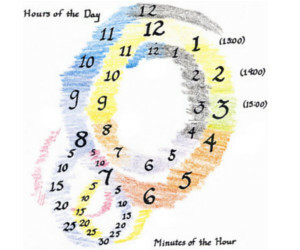 A study by the University of Waterloo in 2006 reveals very interesting ideas about time-space synesthetes. In the study, the participants were asked to draw their mental perception of the months of the year. After a period of six months, they were asked to do the same again. Some subjects were consistent and it was deduced that although the spatial representations seemed bizarre, they were consistent, meaningful and logical for those who hold them. For people with super memory, any thought of the past, present or future automatically and involuntarily activates a spatial relationship with that particular moment thought of. One synesthete, Holly Branigan who works at the University of Edinburgh as a researcher describe her experience during an interview for BBC news. "For me it's a bit like a running track. The track is organised around the academic year. The short ends are the summer and Christmas holidays - the summer holiday is slightly longer. It's as if I'm in the centre and I'm turning around slowly as the year goes by". She also said that when she thinks ahead, her perspective changes. Despite the experience being a typical manifestation in the person's "mind's eye", for some, it is a literal visual space manifestation. Time space synesthesia affects about one in five people. The reason why many might not know that they have this neurological condition is that it's an involuntary process that feels natural. Although not substantiated, the condition is said that could come as a result of cross wiring between the parts of the brain that process vision and the part that processes imagination and memory. We cannot simply snub this idea as a weird oddity since it may be beneficial to the synesthetes in terms of cognitive abilities. In some studies, synesthetes were found to be faster at the recitation of the months of the year in both the chronological and reverse chronological order as compared to non-synesthetes. A separate study found synesthetes to have better memory for both historical and autobiographical events and that they have better marks in visual short term memory tests. "When I'm making plans, I can look at my mental calendar", say Brandigan to confirm these findings. However, there are some downsides, this synesthetes are unable to forget even the smallest and the least important details about the occurrences in their's life. Important: The contents published here are for information purposes only. The information is not necessarily accurate, complete or updated. If you have health problems, ask your doctor.